1,000 hours under the earth. 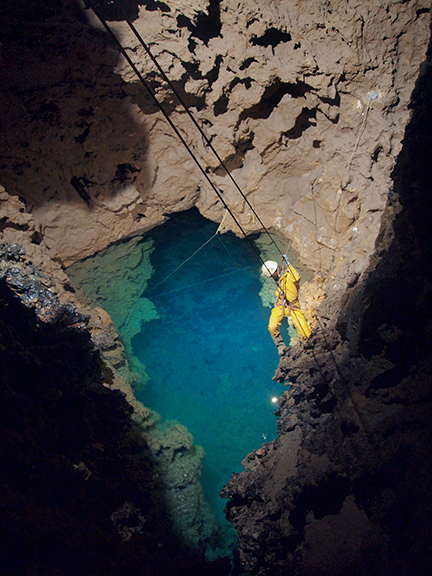 This is the tale of the expedition, led by deep cave explorer Bill Stone, to J2 Cave, located in the Sierra Juárez Mountains of northeastern Oaxaca, México, as told by team member and lead diver, Phil Short. After my speech at the International Tech Meeting 2012 (technical diving convention in Bratislava, Slovakia), deep cave explorer Bill Stone asked me to join him for lunch. As a result of that lunch, during the course of the next 12 months, I prepared for the trip of a lifetime! In a full hour of one-on-one discussion with Bill outside of the lecture hall of the Rebreather Forum 3.0 convention in Orlando, Florida, later that year, we discussed how the trip was moving forward. The time was counting down, and then before I knew it, I was in the cloud forest of southern Mexico about to go underground. The trip? I had been invited by Bill to be a full-time team member and lead diver on the 2013 project to extend the J2 Cave (using the Last Bash entrance) beyond the point reached in Sump 4 during the 2009 expedition. Having now returned, many of my caving and cave diving friends ask, "Wow! Three months in Mexico! How many times did you get to go caving?" And I smile inside at their reaction when I say, "Oh, five." Not many, but it includes once for 19 days, once for five days, once for 21 days and two separate one-day trips, totaling over 1,000 hours under the earth. It all started on arrival at Mexico City Airport with Marcin Gala and the crew from Room 608 media company, who would be ﬁlming the entire expedition for the Discovery Channel as an episode of the Curiosity series. After clearing customs with their 17 bags of ﬁlm gear, we loaded two mini buses and set off for Faustino's Ranch (via a night spent in Paulo) at the base of the mountain that would be home for the next three months, beneath which was the 15-plus kilometer labyrinth of passages that was J2/Last Bash. After a long drive, the last three hours of which were on dirt roads, we arrived late so I slept in the ﬁeld behind the ranch on the ﬂoor in a Bivi-bag to be awakened by a friendly pig at 07:00 the next morning! After coffee, breakfast and a team brieﬁng, we set off up the mountain with Bill and a group of team members to the site that would be our base camp. The walk from the ranch took us through ‘slash and burn’ ﬁelds ever higher until we reached the tree line and entered the cool green gloom of the cloud forest that shrouded the mountaintops and continued to climb. Eventually, the winding muddy trail between the trees ﬂattened out and there was no more up, but no view due to the density of the forest. We were on a ﬂat top to a summit, which would be home for the next three months. We spent the day initially clearing personal spaces for our tents and covering them with tarps. Then, working as a team, we cleared a large area for a workshop tarp and a kitchen tarp, building and setting up the kitchen, digging a latrine and clearing a ﬁre pit. We spent our ﬁrst night around the base camp campﬁre, looking forward to the adventures ahead. I spent the next eight days hiking from base camp down to the ranch, rigging, testing and packing dive gear, then hiking back up to base camp. The idea was to, day by day, acclimatize to the 3,000m altitude of base camp and to build up my ﬁtness by carrying all my gear in increasing loads up the hill on my back. This seemingly crazy idea really paid off when the cave trips started. The heavy gear was delivered to base camp daily by donkeys and drivers from the ranch including our water in 20-liter drums (treated with microdyne) as there was no water source near base camp. The growing pile of dive equipment bags was delivered again by donkey directly to the cave entrance some 200m below base camp. In camp, we had a “re-belay” assessment and practice circuit in a rope circuit up and back down a giant pine tree, with a two-meter-square “dive platform” rigged in the crown. The idea was to use this to assess each team member’s rope skills on arrival and to allow practice. But it also gave us the opportunity to climb up through the oppressive green gloom of the cloud forest, to enjoy the clear blue sky above the roof of the forest and get some sun, watch a sunrise or a sunset, or just chill out. This platform became our sanctuary between trips underground. On day nine, I hiked down to the Last Bash entrance with Marcin for my ﬁrst journey into the cave. The entrance is a small crack against a cliff wall at the head of a muddy gully, and to be honest, very uninspiring! But after a traverse and several tight vertical rope sections, it gradually opens out. One enters a small horizontal room and then it goes vertical again on a very large passage in the form of a 170+m vertical pitch with 19 re-belays getting larger and larger as one drops deeper and deeper into the earth. From here after, we had a brief respite from the rope on a large ledge. The drops continued, bringing us eventually to a short wet horizontal section ending in another pitch at 300m depth from the entrance. At this point (the limit of the rigging teams work so far), we tested the cave telephone wire by connecting to it and calling base camp, and turned to head out, arriving back on the surface after a seven-hour trip. I was excited to go further but realized the enormity of transporting the now complete pile of fifteen 20+kg bags of dive gear to the end of the cave to go diving. This ﬁrst foray into the cave had merely scratched at the surface of the 1,000+m of descent and 8,000+m of horizontal cave to reach Sump 2, our ﬁrst dive site. 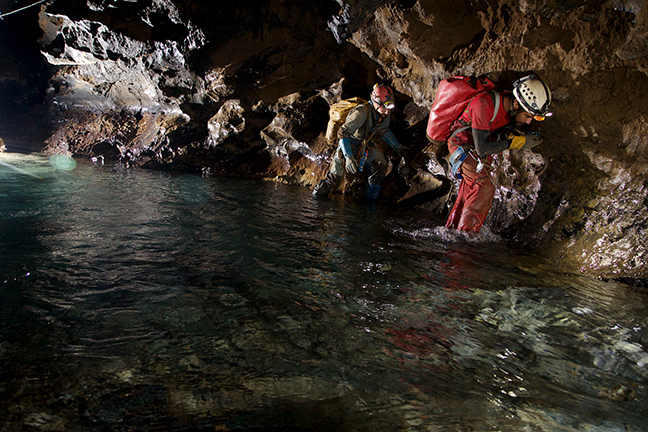 After several more days of packing and preparing equipment whilst the rigging team continued their work to reach “The Bivi” camp at -500m of depth, a three-man team entered the cave to sleep at The Bivi and enlarge the squeezes beyond by digging away rocks, gravel and other ﬂood detritus. The next section of cave beyond The Bivi consisted of a small, wet stream passage with some small rope sections and three major squeezes—a fun “sporting” section of the cave for a normal weekend cave trip, but a nightmare for transporting three month’s worth of equipment through the cave. Expedition team members John, Elliott and Corey did a fantastic job of enlarging the extremely unpleasant ﬂat-out wet squeeze and the two very tight vertical squeezes before the main carry of gear began. On day 15, Marcin and I headed into the cave for the push in “Phase 1”. With a support team, we went from the Last Bash entrance to Camp 2A. (Camp 2 was originally in the J2 section of the cave but was moved to the 2A location at the convergence of Last Bash and J2 when the connection was made). We spent the night there before continuing on an exhausting 11-hour trip to Camp 3 the next day, through a gigantic "borehole passage" and a beautiful section of active steam where Marcin had to repair, re-rig or replace all the ropes on the vertical sections. The next morning, we returned to Camp 2A to start bag hauling from there to Camp 3. Bag hauling is tough, the cave is like the worst obstacle course ever and an intense gym work out whilst cold and wet for eight to 12 hours at a time! Basically, you pick up one or two 15 to 20kg bags and walk, climb, crawl and struggle through the earth, then go back and get more. In some sections, like the Boulder Choke “Breakdown” of Donde Homek, a team spreads out through the very tight and constricted passage and passes the bags man-to-man in a chain, which speeds things up. The next eight days were spent moving between camp 2A, Camp 3 and the Sump 2 base until all gear for the Phase 1 push was at the sump. The dry cave ends at the base of another rope pitch on a rock bridge above the lake of Sump 2. Here the underwater passage is so large that there is no sound or visual indication that this is the J2 River, so the sight is a crystal clear turquoise blue lake five meters below the rock bridge, and I have to say, it was so inviting! The 2009 Dive Platform was in good condition, stored on the “Rock Bridge”. We initially rigged it on the Rock Bridge as a worktable to build the two Poseidon MKIV CCRs (closed-circuit rebreathers) and the other dive kit before lowering it to water level and rigging it as a kitting-up dive platform. So eventually, on March 10, we had two assembled and pre-dive checked MKIV CCRs, four OC (open circuit) bailout cylinders, food and camp equipment, survey and caving gear, and our personal dive gear ready, and were able to lower all to the platform, kit up, slip into the water and dive off into Sump 2. I have been privileged enough to dive many sumps in caves around the world and to also visit and dive some of the world’s most beautiful resurgence and spring sites, but this was a combination. As I dropped down the dive line, descending below the dive platform and the ﬂood of ﬁlming lights, the crystal clear water revealed a 10m-wide, 4m-high borehole tunnel disappearing off in front of me, with grey limestone walls, stripes of calcite “lightning” and a white gravel ﬂoor reﬂecting our lights. The sump was dived and passed by USDCT team members on previous expeditions, and the thick hand line and telephone cable were intact throughout the sump. The thick hand line was laid to ease the bag hauling required to transport camp, cave, dive and survey gear along with food through to the dry cave and Camp 4 beyond. On this dive, both Marcin and I each had a full sump tackle bag and a SANTI dry-bag clipped to our sides. Sump 2 is the ﬁrst sump reached when entering the J2 system by the Last Bash entrance, and at less than 150m in length and a maximum of 7m in depth, was a straightforward dive. On passing the sump, I unpacked and connected the telephone to the telephone cable and called back to our support crew at Sump 2 “upstream” dive base to inform them that we were through, safe and staying. Then Marcin and I stowed our MKIV CCRs safely, shutting them down, and climbed a huge hall of boulder breakdown, passing over the top to enter a continuing dry, mud-ﬂoored borehole passage leading down to the site of Camp 4. At this point, I de-kitted and poured several liters of water out of my drysuit, wrung out my under-suit and base layer, and informed Marcin that the dive through Sump 2 had resulted in a total ﬂood of my suit! Not a big deal with the 15°C water temperature and the short dive time of passing Sump 2, but it would be a big deal for the continued exploration of the cave if I could not ﬁnd and ﬁx the issue. As it turned out, the silicon neck seal had been punctured twice, like a vampire bite under the chin where the suit had been hung over a line but touching the ﬂoor at Sump 2 dive base, over the last few days of equipment preparation. But we were saved! Thanks to the custom design of the J2 SANTI cave drysuits, the neck and wrist seals were quick to remove and replace, along with numerous other cave speciﬁc features. The next morning, I kitted up in Marcin’s drysuit and undersuit and passed back through Sump 2, de-kitted and climbed the ropes to the Rock Bridge to retrieve the seal replacement kit and tools and a spare dry undersuit (along with another bag of gear for further work beyond the sump) before returning back through the sump to Camp 4 and Marcin to replace the neck seal and sleep in the wet undersuit to dry it. Back on schedule! We then had to strip down the MKIV CCRs and all other dive gear to manageable size and weight loads for carrying between just the two of us. (No support here on “the dark side of the moon”.) We traveled the one kilometer to Sump 4 (a dry passage enabling the bypass of Sump 3). This led to five loads each (10km of caving) followed by equipment rebuild and test on the next day, followed by a rest day. Being beyond a ﬂooded section of cave that is 8km horizontally and 1km vertically for several days with just one other human being for company is a humbling experience. It does feel seriously remote, and during the expedition, Marcin and I spent a total of 12 days in a five-day, and then a seven-day exposure alone. On the ﬁrst day of our third week underground, Marcin and I set off into Sump 4 following Jose’s dive line from 2009 into the right-hand branch, and with only one line break to repair, soon arrived at 300m of penetration—the end of Jose’s line and the 2009 explorations. The passage to this point was stunning, meandering left to right in a large, clean, washed passage with white gravel and sand ﬂoors, undulating in waves and heavily rippled from water ﬂow. Visibility, as with Sump 2, was crystal clear, and with our Light Monkey video lights, we got a stunning view of the passage. At this point, I tied on a new line reel and swam on into the unexplored passage, each meter heading further into a piece of the planet never before illuminated or seen by human eyes! As the line rolled off the reel and the passage continued to ascend and descend over gravel and sand dunes and meander to the left and right, it became obvious that as I was going deeper, the sump was not about to surface into dry cave as soon as I had hoped. Soon, the familiar tug on my wrist—as the last of the line fed out of the reel—conﬁrmed 120 meters of new passage at the crest of a large sand dune with three ways on ahead. Reaching our deepest point yet at 12m with the second reel emptying rapidly, we arrived at a wall of ﬂowstone steps blocking the passage from wall to wall, which we ascended step by step to surface in a small chamber of ﬂowstone around four to five meters high, four meters wide and two meters across. We were through the fourth sump, but was there a way on? Removing our masks and hoods to talk, all we could hear was the roar of fast ﬂowing water! A waterfall! The J2 River! Excitement rose. Marcin de-kitted whilst I held all his gear, remaining in mine, and after crawling carefully to protect his drysuit through a hole ahead at water level, he could soon be heard and his light seen to my right. A two- to three-centimeter air space allowed us to talk and for me to see his light. Dipping my head into the water, having replaced my mask, I could see a square hole led through to Marcin’s legs in a small chamber beyond. The small hole turned out to be a perfect Phil-in-a-MKIV-with-two-bailouts size (with a bit of shoving and scraping). After I passed Marcin’s gear through to him, we were able to de-kit and safely stow our gear to see what lay beyond. We ﬁrst swam in a deep water canal of crystal-clear, fast-ﬂowing water between ﬂowstone walls with a stalactite-decorated ceiling before the water got shallow and we could walk downstream to a huge stalagmite. We squeezed around it to the left along with the water into a huge borehole passage beyond. Here, the water cascaded vertically in a waterfall down a ﬁssure on the right wall and ledges led up to the right to enter a high-level, large, ongoing passage. We had passed the primary initial objective of the expedition, Sump 4, and found continuing dry cave beyond that was now dropping deeper into the earth on day 29 of the three-month expedition! We were, to say the least, ecstatic. After ﬁlming all we had found, we returned to our dive gear, kitted up and made a very enjoyable return dive along our own line ﬁlming en-route to Lake T41, the Sump 4 dive base, to de-kit and return to Camp 4 for several coffees and a "double dinner"—having been away for 14 hours—and to telephone base camp with our great news. There was now a lot to consider! The sump, hoped to be short and straightforward, had turned out to be 510m long and posed logistical challenges for the continuation of exploration, so we needed to head out and debrief to allow the team to reach a decision as to the best way forward. Of course, heading out is not as simple as it sounds. The day after the push dive to pass Sump 4, we had to disassemble the MKIV CCRs into three manageable loads and then carry all the gear back through the one kilometer of cave to the downstream side of Sump 2. This took a whole day after which we spent a ﬁnal night (for this trip) at Camp 4, and left early in the morning for the dive out with empty food containers, ﬂat charging batteries and trash. We were met by our support team, who not only quickly hauled our gear from the dive platform to the rock ledge above, but also had a pot of fresh coffee on the go for us (especially appreciated as we had run out of stove fuel beyond the sump and been on water and food bars for the last two days!) along with cheese, sausage and salmon jerky. From here, a night at Camp 3 followed by a night at Camp 2A, saw us reach surface four days after the push dive of Sump 4. The morning after our exit, Bill called a dive team meeting to discuss the new plan in light of what we had found. Fortunately, our support team continuously fed me with coffee and pancakes with maple syrup, as they said that after 19 days underground, I looked like a POW—and indeed, the meeting was going to take a while! The end result was that we would revert to Florida cave style tactics in dealing with this sump, using the dive line as our reference only and swimming lighter, neutrally buoyant loads of essential equipment through to explore the cave beyond. We would now take equipment to establish an emergency Bivouac beyond the sump if needed, to allow cooking and hot drink preparation and to enable continued exploration, rather than the original plan to run a thick haul line and telephone cable through Sump 4 and establish a Camp 5. Other than those logistically driven changes, we were back in business. Before a return trip could be mounted, however, we needed to resupply the cave with food and charging batteries for all camps and resupply Camp 4 (beyond Sump 2). To facilitate this, we agreed that Bill and one other support diver would do a resupply trip to Camp 4 with all the gear required for forward exploration, whilst a support team would carry the gear for this resupply and all resupply for the cave. Due to a shortage of manpower at this phase of the three-month project, I volunteered to go back in four days after exiting and carry gear to Sump 2, support Bill in preparation and kit up to dive Sump 2, and then exit... No rest for the wicked! With the support team, I entered the cave and arrived at Sump 2, via a night at Camp 2A and a night at Camp 3, to help Bill with his resupply dive by lowering gear to the dive platform, packing the haul bags with all equipment required for the next exploration trip, weighting them as close to neutral as possible, and helping the divers kit up. Bill and his team set off with a bag each, dived through Sump 2 and emptied the bags returning to the dive platform for me to repack so they could be returned back through the sump, getting four bags full of gear through Sump 2. Bill and his team then spent the next two nights at Camp 4. They hauled all the resupply gear to Camp 4 and the exploration gear to Lake T41—the entrance to Sump 4. The support team and I returned back to Camp 3 for one night and then decided to do a direct exit from Camp 3 in one long day. We started early the next morning, arriving back in base camp exhausted after a four-day trip, only four days after a 19-day push! I spent the next seven days in base camp eating, reading, eating, sleeping and eating! We were now ready for the main push trip to survey the sump, explore the upper high-level passage and the continuing river passage beyond Sump 4. After a necessary seven days at base camp to recover from the ﬁrst two trips resting and eating, I headed back into the cave with Nick and a bag of personal and resupply gear for a direct trip to Camp 3 on the April 1. Marcin and a new support cave team joined us at Camp 3 the next day with more gear. We then started to prepare gear and pack loads at Sump 2 base to get ready for our dive through on April 5. Our dive through Sump 2 was enjoyable due to Bill’s resupply trip to Camp 4 for us. We had a single manageable load to carry through the sump, so we could have a look around and shoot some video. Once through, we de-kitted and moved to Camp 4 for the night and the next day, we again stripped down the rebreathers and carried all dive gear and other equipment in five loads each through the dry sections between Sumps 2 and 4, bypassing Sump 3 to rebuild all at Lake T41 by Sump 4 to dive on. We had learned our lesson on the previous push and knew that especially now, two months into the project, rest days were important to recover between days of intense gear hauling in order to be ready to dive. We spent the next day at Camp 4 reading and sleeping. On the following day, April 8 (a week after entering the cave), we were ready to go. The dive through with gear was tough due to the drag, but we had managed to make the two bags almost perfectly neutral. So with a carefully slow swim pace, we passed the 510m sump again in 40 minutes. On reaching the far side, we exited through the previously noted squeeze to the passage right and de-kitted, shutting down the rebreathers and storing our dive kit on the ﬂowstone ledge. Still in our drysuits, we swam down the canal and entered the main chamber found on the initial push to establish our emergency bivouac, where we changed from dive suits to cave gear and made a hot drink, whilst preparing the survey and vertical gear. We ﬁrst set off into the large borehole upper passage to the downstream left, running up above the water ﬂow. I moved ahead to the furthest point of direct sight and tied on a tape survey station marker. I labeled it whilst Marcin took distance with a laser, azimuth and inclination readings followed by distances to Left, Right, Up and Down (LRUD) of his position and a sketch of the passage to construct a high accuracy survey (map) of the passage we were exploring. In this manner, we continued in the large borehole tunnel with a sand or dry mud ﬂoor for 150m where the passage ended with a ceiling to ﬂoor ﬂowstone formation. At this point, we returned to our emergency bivouac to kit up in our vertical gear and prepare the drill, hangers and rope to explore the vertical cave taking the J2 River. Sadly (as with many other ﬂood-related battery issues on the trip), upon plugging the battery into the drill and pushing the trigger, we found the drill to be dead and unusable! But thanks to Marcin’s rigging skill, we were able to rig and descend the 11m drop into the ﬁssure to join the J2 River passage below. This section of passage was beautiful, with dark grey or black limestone covered in lightning streaks of white calcite and the crystal clear J2 River cascading along from pool to pool. After the ﬁrst pitch, we carefully (in light of the remoteness of our situation) scrambled our way down the river passage until our progress was halted by a lake in the river that was the width of the passage and appeared to be eight to ten meters long, with undercut walls and deep water. Now, as Marcin and I were in our thermal base layer and vertical gear only, we looked at each other and questioned, “What now? Go back for the drysuits or go for it?” Of course, we grinned at each other like kids at Christmas and went for it, trying to use hand holds along the walls to hold our chests out of the water (and failing). We soon reached the shallow water stream continuing down beyond this point. This stream led on to a second pitch—more like a series of cascades—and a ﬁnal drop into another lake. Here, Marcin again rigged on three natural belay points and descended with me following to pass another lake to a small chamber where all the water disappeared through ﬁnger-width slots in the ﬂoor. Looking above, a climb over ﬂowstone steps to the left led up to a squeeze so small it required removal of our vertical gear. It then led to a small chamber beyond, in the base of a loose, unpassable and again, in light of our extremely remote situation, rather scary breakdown. After a thorough search around to conﬁrm no other ways on through or around the breakdown existed, we returned to our bivouac base, frozen, to make hot drinks and reﬂect. We’d reached the end of J2—covering 1,000m of new, previously unexplored cave between the new submerged section of Sump 4, the high-level passage, and the stream way. Time to start the long journey out. We packed up and moved all gear to the downstream side of Sump 4 and kitted up for the return dive. We dived through Sump 4 and returned to Camp 4 together, after a 14-hour trip, and made a huge and well-needed meal with coffee before sleeping. The next day was a needed rest day spent in Camp 4 eating, reading and sleeping. The following day, we returned to Lake T41 at Sump 4 to empty and repack the MKVI sofnolime canisters, do a pre-dive check and pre-breathe of the rebreathers, before heading back into the sump for the survey dive. Firstly, we swam the 510m length of Sump 4 slowly, side by side, with Marcin against the left passage wall and me against the right. We used video lights to check the walls from ﬂoor to ceiling for any potential missed passages. I had two areas in my mind where there were potential passages, both on the passage right, noted on previous dives. The ﬁrst was a parallel tunnel running for 20m within the original 2009 project section of passage; and the second was at the point where, on our exploratory dive, the ﬁrst line reel had run out (420m into the sump). At this point, I followed a side passage to the right, which climbed a gravel and sand bank to drop into a continuing rift passage that curved sharp to the left to re-enter the main passage on our line after 30m of oxbow. This was the same area the previous left of passage oxbow had been noted on the exploration dive of Sump 4, showing this area to be in fact three parallel passages, all interconnecting. Having reached the downstream side of Sump 4, we turned and with two compasses, two depth gauges and a measuring tape—which we used from survey station to survey station, gathering depth, bearing, distance and passage distance to Left, Right, Up and Down (LRUD)—we made a high grade survey of the sump to complete the data collection. This turned out to be a 150-minute run time dive and gave us an intricate knowledge of the sump. Enough fun! Time to work. The inevitable next step was to pack up and remove all gear from the cave. Marcin and I were joined by two support divers at Camp 4, after they dived through Sump 2 on open circuit, to pack and carry all gear across the one kilometer of cave from Sump 4 to Sump 2 before the four of us made eight-man dives, hauling bags through the sump, clearing all gear and the Camp 4 content from beyond Sump 2. Once through the sump, the cave support team met us to haul all gear up from the dive platform and ﬁnally the platform itself. We made an improvised bivouac for the night at the Sump 4 pitch head. The next morning, we stripped and packed all dive gear into loads of 15 to 25kg, making 17 separate bags. Marcin and I stayed in the cave after our push and survey dives in order to assist the ﬁrst cave support team in hauling all these bags back to Camp 3 and then on to Camp 2A, before ﬁnally exiting the cave after a 21-day ﬁnal trip into J2, via the Last Bash entrance. 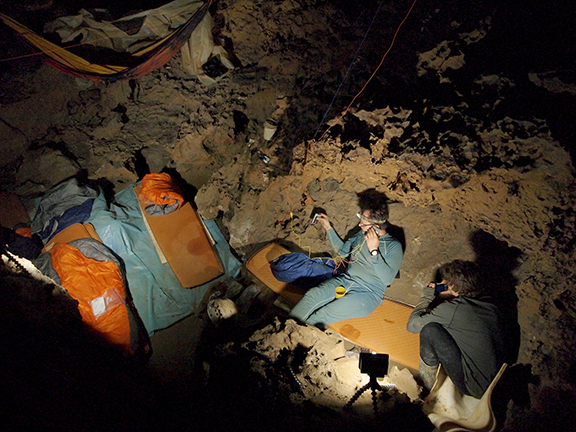 Over the next week, the remaining support teams cleared the rest of the cave of all equipment, breaking down the camps. 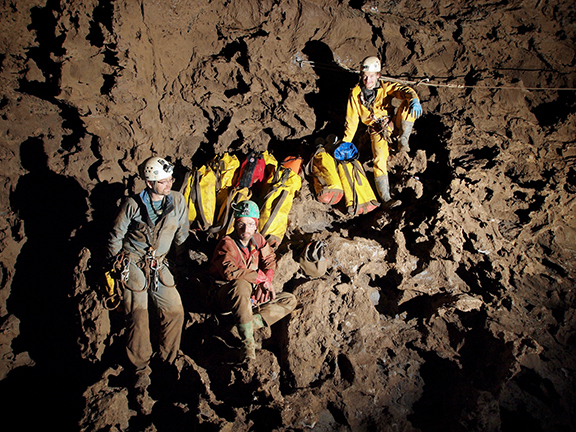 In all, 40-plus bags were removed from the cave. 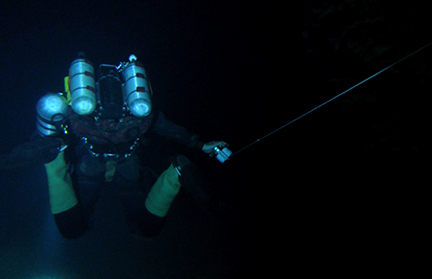 Phil Short is professional cave diver, deep wreck diver, technical diver and instructor. He is Training Director of IANTD UK specializing in training Instructors, Instructor Trainers and scientific, government and media teams. He was part of the first UK deep wreck team, DEEP. In tandem with Kevin Gurr at Phoenix Oceaneering, he has worked on many film documentaries for British television including the BBC and Chanel 4. He currently works with VR Technology Ltd as a technical support consultant, test and development diver on Ouroboros, Sentinel and Explorer rebreathers, and continues with deep wreck and cave diving research projects as well as ongoing projects with the British Cave Diving Group. For more information, visit:www.philshorttechnical.co.uk.